Have you ever been told to “just draw what you see?” Contrary to the casual ease implied by the statement, it is in fact an impossible mission. The way we see the world is infinitely more complex and mutable than the same world represented on a flat surface. We may not be able to draw everything we see, but we can draw some of it. The trick is to simplify so that what you see makes sense on paper. Out of all the visual information we can gather, what do we actually want to use in our drawing? Let’s break it down to Perspective, Value and Focus. are constantly scanning and pausing anywhere of interest and compiling dozens of per- spectives. The more points of view, the more information the brain has to understand where and what things are. In this way, we construct a mental image of the scene before us. We have constructed a collage of sorts out of short-term memories of contradictory perspectives held together in a blurry overall background. It is no wonder that when we draw from life, we find ourselves drowning in multiple perspectives. On paper, we must use singular perspective. The discovery/invention of perspective changed art forever. It is one of the greatest gifts left to us from the Renaissance. It’s not that people were less observant or talented before, it’s just not natural to see the world from one point of view. But it is natural to see the world represented in a picture from one point of view. When perspective is correct in a drawing, the viewer effortlessly understands the form. Without it, we are lost. Ultimately, we must choose one perspective and use it like an armature upon which to place the interesting visual details that we observe. In the real world, value is subjective. When we peer into a shadow, our pupils widen and the shadow appears brighter, revealing previously hidden details. Conversely, when we focus on a bright area, our pupils constrict, allowing in less light so that we can observe details without overwhelming the eye. Finally, our pupils will widen out of pure interest in an area. In this case, to “just draw what you see” could mean redrawing the same areas over and over, changing the values as our pupils contract and expand. In real life, these changing values serve us well, but on paper, disorganized values obscure form. The importance of value is second only to perspective in describing form. Just as we choose one perspective to capture the form, so we must choose one cohesive value range to describe it. 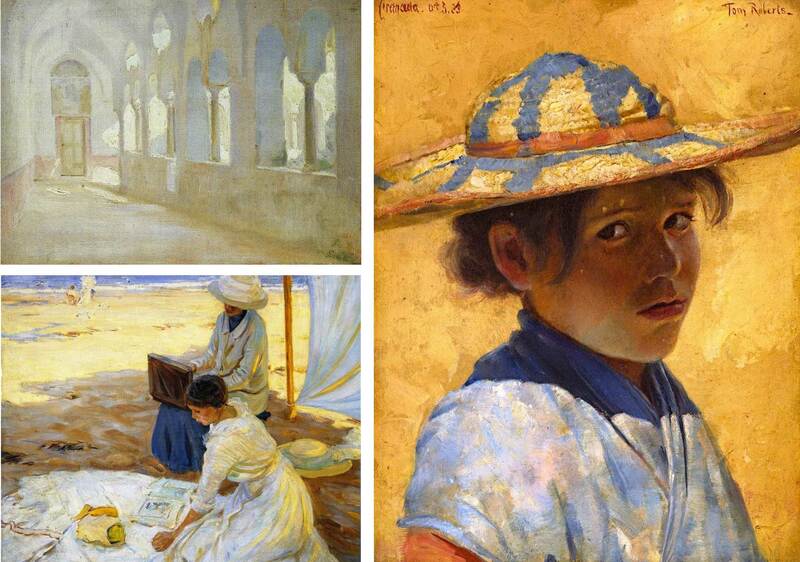 Upper left; Peder Severin Krøyer; right, Tom Roberts; lower left Helen Galloway McNicoll. On paper, we must create a value scale. The importance of value is second only to perspective in describing form. It is after all, light touching an object that allows us to see it at all. Just as we choose one perspective to capture the form, so we must choose one cohesive value range to describe it. We must ensure that the brightest area is closest to the light source and the darkest is farthest away or obscured in shadow. The best way to observe this is to squint. Squinting greatly reduces and stabilizes the light that reaches the eye. When we look at the subject of our drawing with steady pupils, value appears as a logical and organized result of light on form. We cannot see detail very well, but we can identify the darkest and lightest areas of the scene and the soft and sudden gradations between the two. On paper, we decide which parts of our drawing are in focus and what to leave to the imagination. But in life, the eye can only focus in the center with everything appearing progressively blurrier and more monochromatic as it approaches peripheral vision. In addition, we can only focus on one depth point in space at a time. Our brain takes these snippets of information, deleting some and fusing others, and provides us with the certainty that we are seeing reality in a consistent and unwavering fashion. Instead, much of what we think we see is more akin to a dream; a world put together as much from memory and imagination as reality. (It is, I believe, one of the reasons that we dream, to give that part of our brain free reign to exercise its ability to create vivid world immersion unrestrained by reality.) Perhaps one of the reasons that we love paintings, drawings, and photography so much is that they provide us finished examples of what our brains work so hard to achieve when we are awake: a simplified view of the world. One that we can understand.